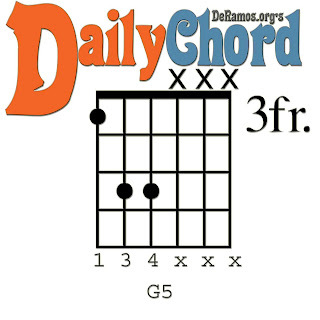 G5 is also known as the G Power Chord. It is neither major nor minor, and it will help you rock and roll! 1. Place your index finger on the Low E string, behind the 3rd fret. 3. Place your ring finger on the A string, behind the 5th fret. 4. Place your pinky finger on the D string, behind the 5th fret. 5. Playing only the Low E, A, and D strings, BASH THAT CHORD!! !